Description: "Antegnati" - the name of the proliferous family of the organbuilders in northen Italy is known to everyone who came in contact with the Italian organ music. They were active through XVth to XVIIth century. Their organs are the typus of the Italian organbuilding school. By the end of XVIth century, the Italian organ assumed the stable form which persisted through the next two centuries. Usually, it had one manual with very primitive pull-down pedal. The basis of the organ was formed by the full "pyramid" of the principal chorus, separating each rank even in the highest registers. Therefore, there is no "mixture" stop found on traditional Italian organ. Instead, the brilliant "crown" of the organ sound is formed by individual principal ranks with the latin names designating their height (15th, 19th, 22nd, 26th, 29th...). As the Italian organbuilders did not build very small pipes, the stops usually break at the 1/8' of the pipe length, sometimes even lower, making an octave repetitions. Therefore, the plenum is dominated by the 2' and 2 2/3' sound, giving a "golden" timbre (while the German type of the organ plenum could be described as "silver"). In addition to the full principal chorus the "Ripieno", there are concertant stops, usually represented by the Flute quint (Flauto in duodecima) = a Nazard, and a "recorder"-like voiced Flauto in ottava. The pedal is usually hardcoupled to the manual without any proprietary stops. In the case of St. Carlo, there is one pedal stop named Contrabassi (Subbas 16') which was added in the course of the history. There are several theories about the origin of the organ in S. Carlo in Brescia. Gilles Cantagrel suggests that the organ was built by Gian Giaccomo Antegnatiat the end of 16th century. Another source attributes the instrument to Graziadio Antegnati who would build the organ "during the first years of XVIIth century". Finally, the modern label located on the organ case reads: "This instrument was built in 1636 by Antegnati organbuilding workshop in Brescia. It was restored by Armando Maccarinelli in 1958 under the technical direction of Luigi Ferdinando Tagliavini and Ernesto Meli." 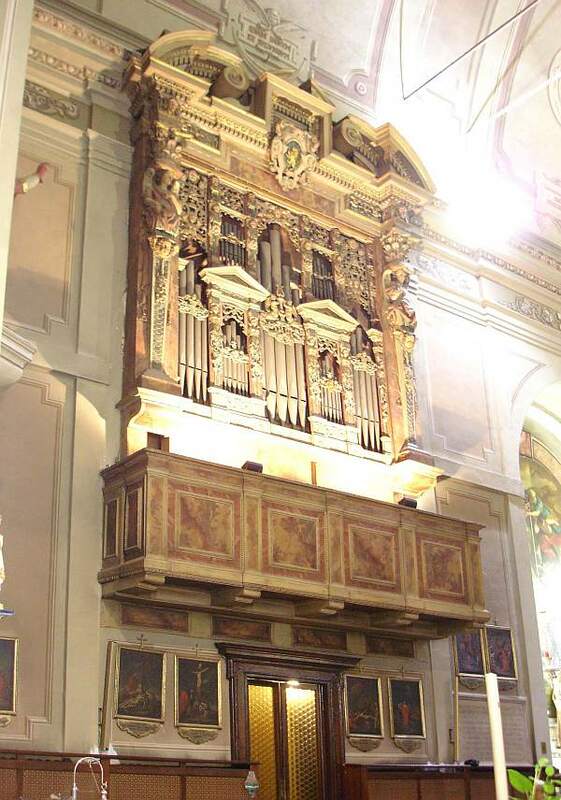 René Saorgin describes the St. Carlo instrument as the ideal of the Antegnati's work: The timbre of its 8 feet Principale is, as the organbuilder himself required, very "cantable" and "delicate". I would describe its sound as "mild". The low pressure of the air (lower than 2 inches) does not "overdrive" the pipe so it is very naturally speaking without any shadow of force or pressure. It reminds me of the Baroque Salicional (not the modern "stringy" Salicional, though!!!) or even Gemshorn. The referrence is made to the treatise of Costanzo Antegnati "L'Arte organica" from 1608, where the famous organbuilder gives his observations and suggestions for the organ performance. His remarks are extremely important for the authentic interpretation of early Italian music. Also the aliquote stops of the principal chorus are gently voiced which gives a subtle and "harpsichord"-like timbre to the whole Ripieno. The aliquotes are used for coloring the Principale fundamental. When performing the music using this sample set, you should not turn the volume too much up! The undulating "celeste" stop Fiffaro should be used - according to the Antegnati advice - only in conjunction with the Principale to produce the beating effect and it is recommended for the slow movements.